The Afghan authorities say they have burned more than 60 tons of illegal drugs in a demonstration of their efforts to curb drugs trafficking. Piles of drugs were set alight at eight locations around the country, the biggest being on the outskirts of the capital, Kabul. Afghanistan produced 90% of the world's opium in 2004. In a similar operation in Pakistan, officials say around 26 tons of narcotics were burned in Karachi. Afghan President Hamid Karzai has predicted a big drop this year in the poppy crop that is the basis for making opium. 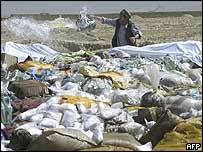 Thirty tons of seized drugs were burned outside Kabul on Sunday, an official statement said. 6 tons of other drugs. The event was to mark the United Nations International Day against Drug Abuse and Illicit Trafficking. "These destroyed drugs will never be injected into the arms of children on our streets or on the streets of Europe," Interior Minister Ali Ahmad Jalali said. The ceremonial destruction of the drugs comes amid conflicting accounts of how Afghanistan's war on drugs is going. Afghan officials say they are seizing ever-increasing amounts of drugs as specialist training pays off and stability grows within the country. On a recent visit to Washington, Mr Karzai pledged to reduce opium farming by 30% during 2005. But leaked US documents ahead of his visit said he was failing to crack down on the trade. The UN has voiced fears that Afghanistan could turn into a "narco-state" if it failed to bring the drug trade under control. Meanwhile in Pakistan officials set light to a stockpile of seized hashish, opium poppies and heroin on Karachi beach. Pakistani police say more drugs have been passing through Pakistan recently in transit to the west from Afghanistan.